I was having a debate with my buddy about index investing vs. other forms of investing such as picking your own stocks or hedge funds. He was shocked that I said that if I was ultra wealthy I'd put everything into Vanguard index funds. He said that he would do 1/3 vanguard total market, 1/3 total bonds, and 1/3 hedge funds. His reasoning was that if you are able to get into hedge funds, they typically invest in private equity. That means that you are capturing more of the total market than someone who doesn't have access to hedge funds. I honestly had no argument against that. The trading cost, turnover, and fees are much higher. But that may be worth it for the fact that you are increasing your diversification and capturing investments into private companies which you'd previously have no access to. Are there any studies or numbers on this, and what to bogleheads think of this reasoning? My understanding is that a lot of institutions with big amounts of money to invest (e.g., universities, public pension funds) have been very disappointed with the results of hedge funds. I think the biggest benefit of hedge funds is to those that run them. technovelist wrote: My understanding is that a lot of institutions with big amounts of money to invest (e.g., universities, public pension funds) have been very disappointed with the results of hedge funds. Do you have some articles or data to back this up? Cliff Asness talks a bit about these exact topics in this video. On the whole, the hedge fund industry gets most of its returns from regular beta/equity exposure. However, there are probably certain types of hedge funds that would give a different type of exposure. I'm reading over Larry's articles now. But the real question isn't the poor past performance, because that does not necessarily predict future returns. Rather does it increase diversification so that if certain industries, or even the global economy, stagnates, it may provide a buffer. The same reason why we invest in bonds although they historically have poorer returns than stocks. They are poorly correlated which is why we invest. Why wouldn't you invest in private equity funds directly? I also don't believe it is actually true that the blanket statement 'hedge funds invest in private equity' is accurate. In any case, these are academic questions. Being in hedge funds might be a diversifier, they may not. It is hard to tell because there is a lack of transparency. edge wrote: Why wouldn't you invest in private equity funds directly? I also don't believe it is actually true that the blanket statement 'hedge funds invest in private equity' is accurate. Fair enough. I suppose if I can access private equity, then it may be a nice diversifier, assuming I allocate the appropriate percentage of my AA to it (which indeed is an academic question). Edit: Perhaps I should have asked about 1/3 total public stocks, 1/3 total public bonds, 1/3 private equity as compared to full index investing. Understood. But one point is that you said "but [private equity] don't outperform similarly risky small value public equities. Again any alpha goes to the fund sponsors". What about diversification? Just because I can likely get similar expected returns by weighting small cap or decreasing bond allocation, isn't there something to be said for capturing more of the equity market in terms of risk/reward ratio? Or is your comment about "alpha going to the fund sponsors" taking that into account? In theory, I think your friend is right-- a fund that harvests alpha or obscure betas (e.g. short side of factors, alternate markets) could provide the holy grail of decent expected returns and non-correlation to equities and bonds. assumer wrote: But the real question isn't the poor past performance, because that does not necessarily predict future returns. Rather does it increase diversification so that if certain industries, or even the global economy, stagnates, it may provide a buffer. The same reason why we invest in bonds although they historically have poorer returns than stocks. They are poorly correlated which is why we invest. Hedge funds may not provide the diversification benefits that you imagine. 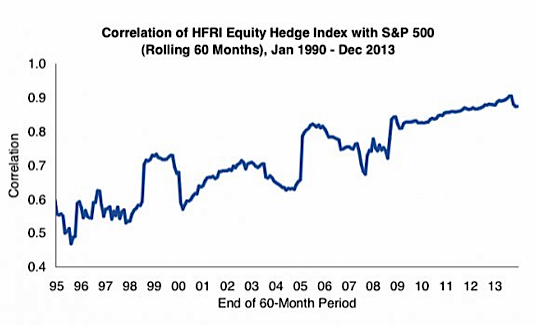 Over the last two decades, the index of equity hedge funds (HFRI) has become much more highly correlated with the broader stock market (chart below). For one's risk assets, I'd stick with index mutual funds or ETFs — you're guaranteed to get the market returns, without paying a 2% expense ratio and 20% of profits. Here is an easy to read blog article about the co-movement of hedgefunds with stocks and bonds. Don't skip until you reach the table at the end. http://www.multifactorworld.com/Lists/P ... e17&ID=141 I am pretty sure, if the author had included emerging market stocks and a commodity futures (CCF), the results would show an even higher connection. From some kind of Private Equity study I vaguely remember such a lagged regression showing smallcap-like stock market exposure. But with a lower R^2 number around 0.6-0.7, which is comparable to REITS or stock industry funds. In both cases there still seems to be some "unique risk" and thus diversification benefit, but you don't get this for 0.15% ER. A large slice of the "uncorrelated returns" of PE or HF will simply be highly overprized exposure to, say, midcap/value/EM stocks, bonds and CCF. Maybe some momentum strategy (think CTAs), but even this you can get as ETF for 0.15% ER. With really big bucks I'd rather go with directly held real estate and the like instead, for diversification. I have some money in private equity, mainly investing in local projects in my city and general region. What I have learned is treat every deal as its own unique venture. Study it as much as you can, get opinions from others, and then invest. You will do very well if you work with the right people.